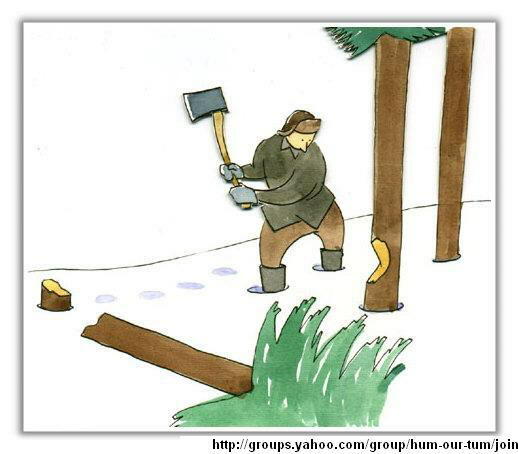 Once there was a group of man - a young hot-blooded chap and a big number of old folks, doing timber job in a jungle. having to break few times a day to drink and chat. As times goes by, this young chap noticed that even though he worked through break time and hardly took a rest. those old folks are chopping the same amount of trees as he did and sometimes did more than he did. It was as if those old folks work through the break time as he did. So he decided to work harder the next day.unfortunately the results were even worse. One day, one of the old folk invited him for a drink during their break time. That young chap refused and said he has no extra time to spend! Then the old man smiled to him and said it was just a waste of effort to keep chopping trees without re-sharpening your Axe. Sooner or later you will give up or be so exhausted as you have spent too much energy. Suddenly the young chap realized that actually during break times while those old folks were having a chat, they were also re-sharpening their Axe at the same time! And that's how they can chop faster than him and yet spending lesser time! The old folk said what we need is efficiency by making use of our skill and ability intelligently. Only then can we have more times to do other things. Moral of the Story: By taking a short break during work, it would make you feel fresher, think well and work better after the break! (Or am I just finding excuse to take a break). But by taking a break, it is not to stop work but to rest and re-think our strategy to go about it from another angle.